Rod Windsor played only one year at wide receiver in college at Western New Mexico, but he made it count earning All-Conference Honors with 1,118 yards on 81 catches to go along with 6 TDs. 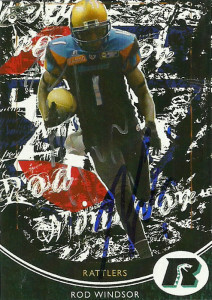 Going undrafted, Rod joined the Rio Grande Valley Dorados of the AF2 in 2009 where he made an immediate impact. He’d rack up 184 receptions for 2,364 yards and 59 touchdowns, and his efforts translated into Rookie of the Year and Offensive Player of the Year Honors. In 2010 Windsor became a member of the Arizona Rattlers of the AFL. Again he’d have a banner season with 193 receptions for 2,372 yards and 47 TDs, earning Rookie of the Year Honors there as well. 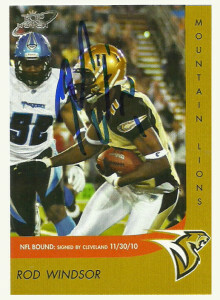 Eager to springboard to the NFL, Windsor joined the Sacramento Mountain Lions of the UFL after the season. He’d have a respectable season with the MoLos with 25 receptions for 379 yards, a 15.2 YPR average, and 3 TDs. Rod then bounced around in between the Browns and Bills practice rosters, but with the lockout on, and Windsor not being a high priced player, he jumped to the AFL in 2011 to play for the Rattlers. He’d earn First Team All-Arena Honors, as he caught 156 passes for 1,830 yards and 36 TDs. Afterwards, with the strike over, he returned to the Browns, where he was reassigned to their practice squad. Rod opted to return to the AFL in 2013 with the Rattlers, earning Second Team All-Arena after totalling 110 receptions for 1,590 yards and 42 TDs. He’d cap his season off with MVP and Offensive Player of the Game Honors for ArenaBowl XXVI, as he pulled in 10 receptions for 145 yards in Arizona’s victory over Philadelphia. Well, where there is a will there is a way. The Talons game against the Rattlers provided me with the opportunity to get autographs merely by leaning over the rail at my choice seating spot (near the visitors bench in the end zone) and merely getting the player’s attention that I wanted. I then had players daisy chain to the next player that I needed until I got all three members of the Rattlers knocked out who were members of my TNT AFL 11 promo set. I did not have any more extras cards of Rod to give him as I did the others. Unfortunately I had blown those over the past 2 years on failed attempts through the teams he had played for previously. Still he’s one of the bigger AFL names that I had been wanting, and after explaining to him what happened, he almost looked like he flashed a wry grin of “I got them and thought they were so awesome I kept them all,” so I didn’t feel too badly. He absolutely torched the Talons during the game, adding another 96 yards and 3 TDs on 7 receptions including a diving catch into the back of the endzone I was in. 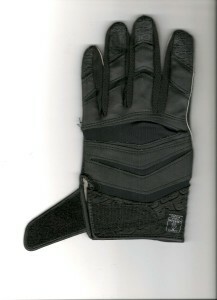 After the game I caught his eye and congratulated him on his great effort and in return he gave me one of his gloves. A nice momento, and a classy move by another Arena player in a league that continues to prove it cares about its fans. Despite the fact that the Rattlers are considered the Talons division rival, they have quickly established themselves as my second favorite team thanks in part to guys like Rod.